Armed groups in Libya are holding thousands of people in detention where they are being submitted to torture and other human rights violations, according to a United Nations report published on Tuesday. The study, by the UN human rights office, OHCHR, and the UN Support Mission in the country, known as UNSMIL, estimates that some 6,500 people are being held in official prisons while thousands more are in facilities nominally under the authorities or that are directly run by armed groups, some of which are affiliated with the State. “This report lays bare not only the appalling abuses and violations experienced by Libyans deprived of their liberty, but the sheer horror and arbitrariness of such detentions, both for the victims and their families,” said Zeid Ra’ad Al Hussein, the UN High Commissioner for Human Rights. One facility, believed to be the largest of its kind in western Libya, houses 2,600 people who face torture, unlawful killing, denial of adequate medical treatment and poor detention conditions. “Men, women and children across Libya are arbitrarily detained or unlawfully deprived of their liberty based on their tribal or family links and perceived political affiliations,” the report stated. The report’s findings are based on first-hand accounts and other information gathered from sources inside Libya. Some detainees have been held since 2011 in relation to the armed conflict that led to the overthrow of former President, the late Muammar Gaddafi, and a surge in armed groups. The report further stated that since renewed hostilities broke out in 2014, armed groups on all sides have rounded up suspected opponents, critics, activists, politicians and others, while hostage-taking for prisoner exchanges or ransom is also common. “Rather than reining in armed groups and integrating their members under State command and control structures, successive Libyan governments have increasingly relied on them for law enforcement, including arrests and detention; paid them salaries; and provided them with equipment and uniforms,” the report said. The authors are calling on the Libyan authorities to condemn torture, ill-treatment and summary executions of those detained, and to ensure accountability for these crimes. 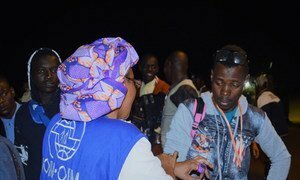 The United Nations migration agency and the Government of Niger welcomed the first 504 people from Libya to Niger, kicking off a voluntary mass evacuation of nearly 4,000 migrants.